Technology drives society. In the scope of education, technology vastly affects learning. I embrace the role of technology in the classroom by going fully digital. Let’s take a look at what I use for class and the benefits I reap. I own an iPad Mini and love how every aspect of my class is used on it. It has all of my notes, textbooks and access to slides and other educational tools. Textbooks weigh too much, and personally, I hate carrying heavy objects in a backpack. My iPad Mini 2 weighs 331 grams, which is significantly less than all of my textbooks. The iPad works wonders because I can have all of my textbooks on one central device without the weight of the books. The e-books are also beneficial because I can easily search topics and pages. This saves time from having to shuffle through physical pages. I can still highlight pages and take notes in the margins with the note taking tab. Plus, e-textbooks through the Kindle app are available on phones, tablets and computers, so I can have my textbook with me even when I’m not in class or studying. 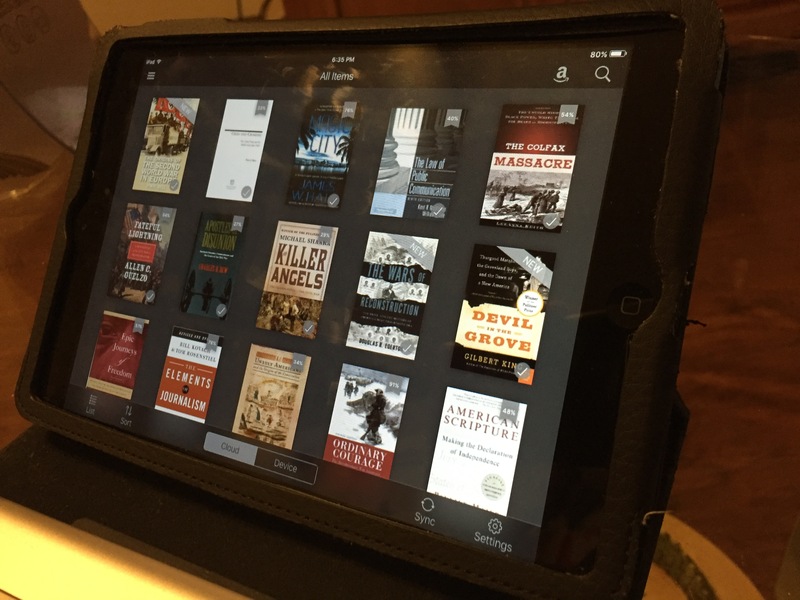 E-books stored in Kindle allow for the accessibility of textbooks without all the weight of the physical book. Photo by Scott St. Lifer. I know it is difficult for some people to give up the hard copy of a textbook. But trust me, it is worth it. My back and wallet thank me. I know an iPad is pricey ($399 for an iPad Mini 4), but the cost of e-books are a fraction of what a printed book costs. The e-book of Killer Angels by Michael Shaara (a book I used for a history course at the University of Florida) costs $7.99 while the paperback form of it costs $12.20 on Amazon. This is only one of the books I used but the savings on e-books adds up. The iPad is also useful for in-class note taking. I prefer using Google Docs because all of my documents are saved to the cloud. This allows me to access my notes from any device: phone, computer and tablet. It also gives me the capability to collaborate with groups on assignments or study guides. Plus, for me at least, I am able to compile my thoughts and take notes at a quicker pace. When I used to write, it took significantly longer for me to gather my thoughts. 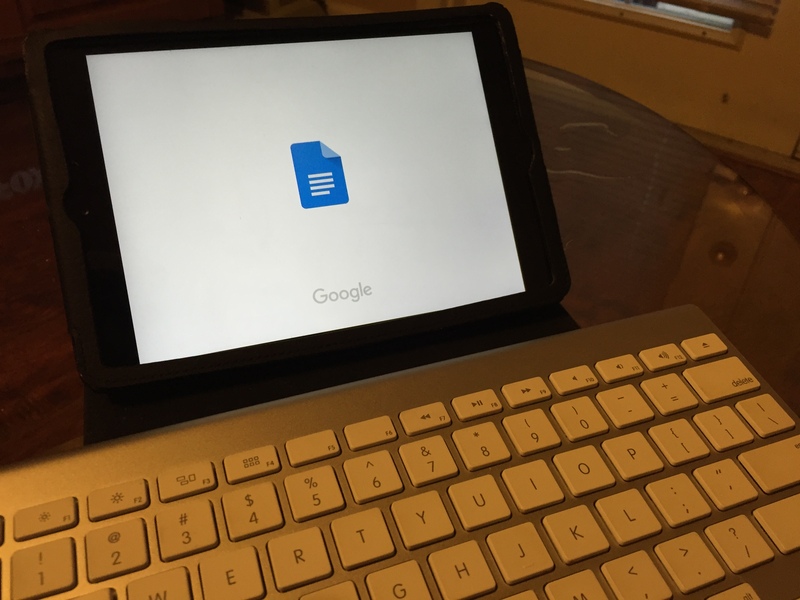 Google Docs allow notes to be stored virtually. Access to documents saved on an iPad can be edited later from a computer. Photo by Scott St. Lifer. I know some people may prefer the more traditional ways of learning with a hard textbook and pen and paper and may learn better with them. I am not saying my method is the best way to learn, but I love it for its convenience.